Harry Potter's Forbidden Journey - Who Knew Waiting in Line Was so FUN! I went back to the Wizarding World of Harry Potter to and rode Harry Potter's Forbidden Journey. However, unlike last time I stood in the regular line and all I can say is "I am glad I did." and here is why you should too. While in most cases I hate lines and I hate waiting, this line is some much more than a line it really is part of the experience. Well let me clarify that - Once you get in the castle the experience really begins. If you take the Single Line, you miss all this. So what is so special about the Forbidden Journey line? It really is a great experience. I will keep uploading videos and building out pages our Orlando Vacation site. We got into The Wizarding World of Harry Potter and have started posting short video clips from our visit to Universal's Island's of Adventure theme park in Orlando. We are creating pages on our site so you can view the Harry Potter theme park videos quickly. 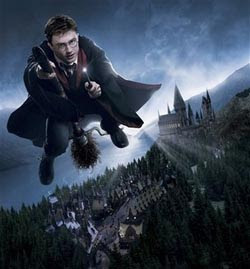 We also created a Facebook Harry Potter page so you can add your own photos, videos or comments. Join today. We have more and are working on uploading them! Visit my site for more Orlando Vacation information!